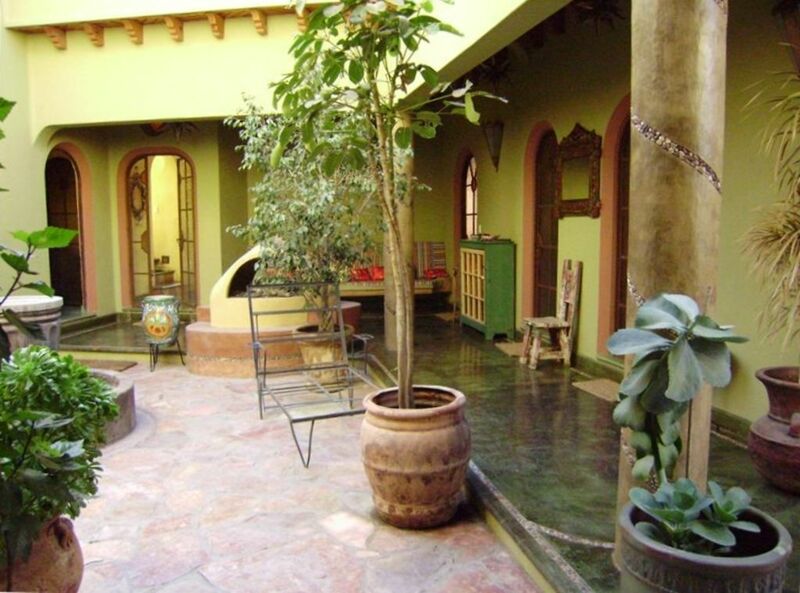 Enjoy our beautiful and spacious home, 'Villa Paradiso,' in the colonial town of San Miguel de Allende, a historic and cultural jewel of winding cobble-stone streets, artisan markets, and Mexican charm. Our quiet villa has 3 private bedroom suites off a shared garden courtyard. Fun, unique design elements blend with Spanish Colonial style for a strikingly beautiful place even by San Miguel standards. Ideal for one or two families with kids, a couple, or group of 2-4 couples or friends. Safe stairwells and balconies. All ages welcome. High ceilings, natural light, many windows & beautiful architectural details (including arched boveda brick ceilings) and folk art in a peaceful setting from which to explore all that San Miguel has to offer. Built in 2005, the villa has a total of 3700 sq. feet of colorful indoor space, plus loads of outdoor spaces within the private walls. Three large bedrooms (w/en suite bathrooms) open out onto the lower courtyard. Living room opens to large patio with view. Ascend the regular staircase to the amazing roof terrace to take in the beautiful views. Two fully equipped kitchens & laundry. We even have a piano and a comfy TV room with large TV and DVD. Villa Paradiso is wonderfully located, a five minute ride by taxi from both the Jardin (the centre of town) and Mega/Gigante, SMA's most convenient large grocery store. Taxis in SMA are both plentiful and inexpensive. 35 pesos (flat rate) will take you anywhere in town. Frequent taxis pass by on our street. If you prefer to walk, a leisurely 25 minute stroll down cobblestone streets, past SMA ' s celebrated Parque Juarez will bring you to the centre of this historic town. Ours is a quiet neighborhood. Nestled on a gated cul-de-sac, Villa Paradiso is also a 10-12 min. stroll from the famed Instituto Allende. Villa Paradiso offers stunning views of mountains, neighborhoods of San Miguel, and the beloved Paroquia from the second floor patio and roof-top terrace, where you can watch the fireworks at night. Decorated with colorful textiles, ceramics, and art from all over the world. Perfect for Outdoor Living! Relax and entertain outdoors on three levels. The first floor rooms surround a lush garden courtyard with fountain, cozy seating area and fireplace. Second floor has a spacious patio complete with large tile dining table, with gorgeous views and flowering plants in locally-made ceramic pots. The rooftop terrace has a dining table and stunning panoramic views. The bedrooms also have smaller private patios and small tables for a quiet glass of wine or a good book. Two terraces have a comfy chaise lounge with cushions. Bedrooms: (#1) king bed, en suite bathroom, and private patio; (#2) queen bed, en suite bathroom, private patio area; (#3) queen bed, en suite bathroom, French doors to shared courtyard. All bedrooms have great closets. Mattresses are high quality (American made). Cozy blankets and quilts for the chillier winter nights. Four full bathrooms have lovely rustic tile, modern fixtures, and unusual architectural details. Two fully-equipped modern kitchens, w/modern stainless steel appliances, and gas fireplaces in each living room. Water purification system makes tap water in the main kitchen drinkable. Bottled water throughout the property. Luxurious details and colorful textiles, ceramics and artwork throughout. Vonage phone line with free calling to USA & Canada, wireless cable Internet service, Large flat screen TV and DVD in the media room - close the door if you prefer no TV. Bring your own I-pod for use in our Ipod/CD system in the main living room. Our wonderful housekeeper comes 3 days a week (to wash your dishes, change & wash towels and sheets, and clean house) at no charge. Additional hours and/or cook, driver, and English-speaking tour guide are available for a fee. NO SMOKING anywhere on premises. For lots more photos, see link below. 3 Bdrms & Baths plus downstairs kitchen and living room are WHEELCHAIR ACCESSIBLE. We are a family from Oakland, CA who fell in love with San Miguel and this house on our first trip in 2008. We plan to retire here someday, but for now we come a few times a year, and share our dream-come-true with guests who enjoy the comforts and visual treats our lovely villa has to offer, both in and out! We chose this house first for its views, large rooms, loads of natural light (unusual because the living room has the best views and light), and unique design. We also love its perfect location in relation to the hub-bub of San Miguel. Everything is a pleasant stroll away, just outside of the noisy activity of the local night-life. We love the authentic Mexican neighborhood (great tortillas, carnitas, and fruit shops just steps away), but also appreciate having gated parking. We can watch the fireworks from our large roof terrace, and enjoy outdoor dinners on the second floor patio. This place is REALLY spacious and well-lit! The main living room is a great place to draw or paint because of the natural light coming in from 2 sides and the ceiling skylights. We have privacy in the many intimate spaces on the property, yet there is an airy open feel to the house. We can sleep in while our kids play their music in another room. It's fun to cook dinner in our kitchen with its modern appliances, including a great Bosch gas stove. Movies are excellent on our big-screen TV, but when we close the door to the media room, we don't see the TV at all and can focus on more artistic and cultural pursuits. We buy fruit from the little old couple who sell from their truck around the corner, special carnitas and handmade tortillas within 5 minutes walk, and we are near the pharmacy, grocery store, and all other necessities. Cabs cruise the street outside the cul-de-sac all day & evening. New: Organic Farmer's market on Saturdays a few blocks away. View of La Paroquia, centro, & surrounding hills. Panoramic view of hills surrounding San Miguel, as well as historic town. (3) Local phone & Vonage (for free long distance to/from USA & Canada) in Casa. All new Egyptian cotton 400 thread-count linens, comfy comforters, great cotton towels. (2) One in Casa and one in Casita. WiFi Available everywhere on the property. (3) Gas fireplaces in both living rooms, and outside courtyard. Vonage service -- free calling to USA & Canada. In casita kitchen. Housekeeper washes your dishes in the main casa. (2) Two fully stocked kitchens. Dining table inside main living area and a larger dining table outside on 2nd floor Terrace, and smaller table for 4 on 3rd floor terrace. Boveda brick ceilings in several rooms, art and crafts from all over the world. Long-term guests pay their own utilities. Very beautiful house , the architecture is very creative , well done . Walking or taking a taxi , it was so easy ! The mexican people are so lovely , always ready to help and be of service . Beautiful location, Great management, Artistically design home !!!! We stayed at this house during our first visit to San Miguel de Allende. It was over the New Year holiday, which is a very busy season for the city. The elevated location and the house’s multiple levels and balconies gave us a great view of the center of town. There are many walking routes to the city center to choose from, which allow for great exploration. Approx 25 min walk to the main plaza. Taxis are easily accessible both directions. We were able to relax at the house away from the action, while having easy access to the busy areas when we wanted to eat, shop, and explore. The large house is beautiful and very well maintained. Dalia is thorough in keeping it clean and the house manager we encountered, Lucha, visited to ensure everything was working properly. Everything was in excellent condition. Communication from the owner was good from the time of booking through our visit. Highly recommended rental. You won’t be disappointed. Our first impression was that we were entering a house designed by Gaudi of Spain. Beautiful architecture. The house is very grand and impressive with a fountain in the courtyard. Lots of taken care of plants everywhere and impressive views. The bedrooms are all well decorated. I didn't love it for our family with little kids because we had to close all bedroom doors at night since they open into the courtyard (there were not many but enough mosquitos to make us close doors). But would be awesome if you value quiet because the doors and walls were solid. As far as noise, the neighborhood is on a cul de sac away from the road so you don't get much normal noise. But you aren't insulated from the j brakes on the nearby highway or the strange 5 am fireworks that happened pretty regularly. The kitchen has lots of serving ware and sufficient cooking tools for vacation cooking. The WiFi was strong and reliable. The maid was sweet and quiet. The lay out and size is perfect for 2-3 small families traveling together. The owner was easy to work with and attentive. The distance to town is easy for adult legs but was a stretch for kid legs, so we found ourselves grabbing a taxi everyday back to the house (for about $3). Great fresh tortillas, produce, small grocery, liquor store, ice cream, and hair salon about 2 blocks away. Tasty restaurants at the bottom of the hill on the main road, about 4 blocks. We’d love to have your family back as guests anytime! This was our first trip to San Miguel de Allende and we plan to return again. San Miguel exudes beauty and Mexican culture and life, which is what we wanted to experience when we planned this trip. As far as the home, Villa Paraiso, I have to agree with the other reviewers. The home is beautiful and well-kept. It was a wonderful place to rest and relax after busy days of walking and sight-seeing. The staff, Dalia, Lucha, Angelica are all very helpful. I still remember Lucha's warm smile and welcome when she opened the door to the home on the day of our arrival. She took the time to show us the home and to answer all of our questions. My family and I cannot say enough about the location. We loved the fact that we had to take a 20 minute walk to the centro every day. It gave us a chance to explore the town and see daily life. We even enjoyed the walks home, which included more up hill climbs. For people looking for a truly authentic Mexican experience, I think this is the perfect place, because the home is close to a tortilleria, small grocery stores, and fruit stores. We enjoyed walking to the small markets every day to pick up food. We also enjoyed watching the kids going to and from school. Thank you to Suzanne and her staff for such a lovely home. The entire trip was memorable and we definitely plan to return. Returning to San MIguel de Allende this summer, our family choose to return to Villa Paradiso. Staying here two years ago was memorable and the peacefulness, beauty, space and convenience that Villa Paradiso offered was memorable. The home offers space to accommodate a family of 5-6 but, also is very comfortable for 2-3 people. We have family and close friends come and go during our stay and having the flexibility of space makes it easy to accommodate everyone. The terraces offer quiet places for reading, watching the sunset over the mountains and watching the sun illuminate the valley as it rises. The location of Villa Paradiso is walking distance to many places, including Centro. We love picking up fresh tortillas from the tortilleria down the street, selecting produce from the local fruteria and taking the different walking routes to Centro or Parque Juarez. It is close to the Instituto Allende, and on the weekends, it is easy to walk to the TOSMA organic market. And, while close to so many things, it is quiet and peaceful. Suzanne and her local staff have all be very wonderful in accommodating any needs and answering any questions. They are very quick to respond and do a wonderful job taking care of the home and it's guests. Villa Paradiso has been a wonderful place for us to stay. This beautiful home was our home in San Miguel for 8 months of the year for 3 years starting in 2013 until we bought our own house nearby in June of this year (that explains why there are only a few reviews during this 3 year period). I can't say enough about the beauty, comfort and charm this house offers. We have been in many homes in San Miguel and none compare to this one. And we weren't the only ones who loved it. Our friends would invariably light up when they walked in and wonder how we found such an amazing place to live. The house takes advantage of the incredible climate in San Miguel with its indoor outdoor layout. The architect knew what she was doing because the house is always airy, light-filled, and a pleasant temperature. It helps that the owner has great people working there (sweet Lorenzo the gardener, hard-working Dalia the housekeeper, responsive Luz the house manager) who ensure it is kept well-stocked, in excellent condition, and impeccably clean. As such there's nothing to do but enjoy the gracious living this house provides. The bedrooms are on the 1st floor and the living area is on the 2nd floor to take advantage of the views. Most nicer Mexican houses have small, dark kitchens tucked away but this house has an open floor layout with a central kitchen that is a perfect size for simple chips and guacamole or works perfectly for entertaining a larger group. The living room has a cozy feel but with lots of space, sunlight, high ceilings and tasteful Mexican art. Bright bougainvillea, lavender, and jasmine in terracotta pots on the many terraces are so pretty that you could almost take your eyes off the awesome views of San Miguel for a momentito. This house is also unique in that it is beautiful AND family friendly! We have 3 children and it served as a perfect family home. It worked well for our family and the casita was an absolute bonus when we had visitors in town. The casita isn't quite as charming as the main house but it is still very nice and comfortable with 3 bedrooms, 2 bathrooms, a fully stocked kitchen and a terrace with views. The location of the house is really great because it's a pleasant walk to Centro but just far enough away to feel like you are in a real Mexican neighborhood. I really appreciated the convenience of having a tortilla shop and veggie/fruit market just down the street. It is a wonder that there is ever any availability for Villa Paradiso. It's truly a gem. Enjoy! Art Classes at Instituto Allende & Belles Artes and from private art teachers, Spanish classes, Live Music nightly all over town, Handmade Ceramics at nearby town of Dolores Hidalgo, day trips to UNESCO World Heritage Site Atontonilco, and lovely university town of Guanajuato, July International Short Film Festival, August Chamber Music Festival, Mexican celebrations throughout the year, Salsa Dance Lessons (free at Mama Mia), Hot Spring Spas 15 minute taxi ride, Art Galleries, Movies, & Lectures at the large Bilingual Library, Performance Events, Yoga, Tai Chi & Bridge, Spanish Conversation Groups, and great shopping! Discount for Return Guests. No Smoking on the property, inside or outside. $500 fine for evidence of smoking. We are an allergic family, so please do not allow your guests to smoke in or outside the house!